to a precision of ± 0.005V. Is there enough charge in my A123's for the next flight?? ALL cells AT LEAST 3.30V? Dimensions: 3-5/8" x 2-3/8" x 5/8", Weight: 2-1/2 oz. Updated and NEW Lower Price! 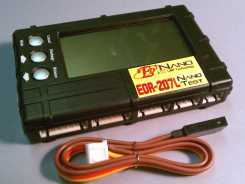 EDN-XH2S-JR Adapter ($10 value) for ED-Nano (A123) 2S Receiver batteries!